Each quarter of the heat travels its own four-pass path (see illustration below). 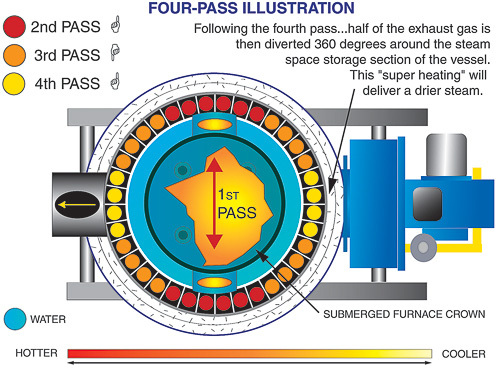 This illustration shows the progression of four gas paths around the circumference of the boiler shell. Second-pass follows path through fins along outside of shell. Third-pass follows path through fins along outside of shell. Fourth-pass follows path through fins along outside of shell, then merges together to exit exhaust stack. We specialize in customizing your boiler. The Cyclone can be equipped to suit a wide variety of installations and specifications. We will help direct you to the most cost-effective models and features. Unit is skid mounted for easy handling. Factory wired with wiring schematic included in the manual.Efficient and space saving layout. The Cyclone is available in a complete package with an optional compact boiler-mounted feedwater system for a finished wired and piped, ready-to-fire unit. Blowdown separators are also available. Heat is forced down, with the fire whirling and spinning against its natural flow. This pattern enhances recirculation, mixing and heat transfer, driving more energy into the water for greater fuel-to-steam efficiency. The furnace crown is water cooled, eliminating troublesome refractory breakdown inherent inunits of inferior design. No fire tubes, water coils or “in the fire” mud rings to burn out. No step ladder is needed to service. No bending over or sitting on the floor. The air intake is located in the center of the unit so dust is not pulled from the floor. Fire does not pass under the bottom mud ring, eliminating the blistering that occurs with other designs. Cooler furnace gases are located at the bottom of the vessel where scale is most likely to occur. Baking of scale is alleviated. Fireside fin access in top and bottom. Access opening above feedwater inlet for easy cleaning. Thoughtfully engineered with the owner in mind. No heavy doors or covers to complicate service procedures. Electrical components are located away from the floor, helping eliminate the possibility of water coming in contact with electricity. Boiler built to ASME Section 1, High Pressure Boiler Code.CSD-1 approved.